We have been extremely busy here at zapsplat.com over the last few weeks with a brand new redesign of the site about to be launched (which has been in progress for months), Justin working on the audio for a game plus a large number of sound effect requests coming through via Facebook and email. It’s been a challenging time and we’ve been doing our best to get everything done. So there is a lot of exciting news coming your way in the next few days. In this article I wanted to tell you about some of the requests we’ve received and how we created them. It was a complete coincidence that we had two separate requests for VHS tape sound effects come though at the same time via our Facebook group both asking for different sounds, but ones we could create simply and with just two cassettes. Not having any to hand, I took a trip up to a local charity shop warehouse (which, by the way has now become a go-to resource for all things Foley) and picked up 2 brand new cassettes. Once back in the studio, we set about recording. One of our members is working on completing a movie that was started in the 80s’ on Super 8 film. I can’t go into any details, but I was asked to record several sounds of unwinding the tape from a reel and movements of the loose tape along the floor. I started by removing the plastic case from the cassette and taking out the reel. I then close mic’d the tape being pulled while the reel spun. Next, once all the tape and been pulled from the reel, I recorded the tape being dragged across various surfaces, from a wooden floor to concrete. These were then sent over for approval. This was an interesting project to work on and took a little while to figure out the best source material to use. I settled on VHS tape because it was easy to access and it looked like it would fit the bill. I am glad it worked for our member who requested them as accessing Super 8 tape would have been a bit of a nightmare! This second request was simply the sound of someone stomping on the plastic case. I miss-read the message and mistakenly recorded me stomping on the loose tape on the ground, when the member actually meant the case itself. Therefore I had to use the second cassette for this recording. It was performed outside on concrete, then edited in Adobe Audition and sent over. While we had a few of these in the library, we didn’t have anything that was usable by a member who requested more via email. 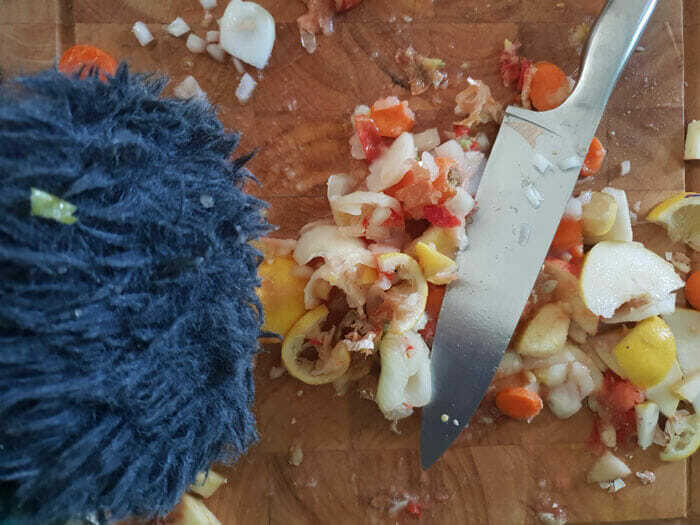 So I dedicated an afternoon to gather up as many vegetables I had in the fridge, then set to work chopping them all up. I used a wooden chopping board and large kitchen knife for the actions as the hollow wood board worked as a great surface, while the knife which was large produced the best sound in terms of size. Not much to explain here with the chops and slices, other than I performed as many variations as possible which range from long slices to short chops. I edited and uploaded each as single versions due to the fact that this was easier for our member to then pull into their project and synchronize to picture. That’s it for requests today. We will be uploading more this week! As mentioned at the beginning of this post, we have been working on a brand new design for zapsplat.com and will be launching it this week. This will require a small amount of downtime (5 hours) so if you visit the site this week and you see a maintenance page, it’s because we will be in the process of updating the site. unfortunately being a smaller operation, we can’t easily keep the site live on a second server while we make the switch so your patience will be appreciated. I’ll be putting up a post to explain the new site and features once we launch and we know you’ll love the new site. Nothing will change in terms of functionality, other than some new search filters for categories.